We’d love your help. Let us know what’s wrong with this preview of Jelly Belly by Robert Kimmel Smith. To ask other readers questions about Jelly Belly, please sign up. This book was very good. The Grandma shows forgiveness because she forgives Ned after the hurtful words he said. She also shows love because when everyone else was mean to Ned about his weight, she showed Ned and proved to him that she will love him no matter what he weighs. I read this the first time in fifth grade......I know this because I found my fifth grade teacher's name in the front cover. I kept the book and I'm not sorry. She wasn't ver nice. But I did enjoy the book then and now. I read it recently to the kids. We were looking for something with less substance than Call of the Wild (yuck). My kids thought it was funny to find out how the boys stashed junk food at fat camp, and the whole book just made me hungry. I'm sure that wasn't the author's intended I read this the first time in fifth grade......I know this because I found my fifth grade teacher's name in the front cover. I kept the book and I'm not sorry. She wasn't ver nice. But I did enjoy the book then and now. I read it recently to the kids. We were looking for something with less substance than Call of the Wild (yuck). This is a terrific book for studying social issues. Ned's choice to TRY and lose weight is the hardest part for him, and without giving any spoilers, I want any future reader out there to know that the book is worth reading on so many levels. I read this one about...30 years ago, got an autograph from Robert Kimmel Smith somehow, and am so glad I picked it up again. Really terrific for 4th/5th grade readers. Funny, on-point, thematic, and, of course, has problems that must be faced. Best Fat Camp Book Ever. I borrowed this one from my church library and just never returned it. Sorry, Mrs. Bergin. I first read this book perhaps 20 years ago. I remember I got it at a Goodwill or one of those thrift stores. To this day it remains one of my favorite kid books. I recently thought about it and decided to pick it up again. I'd read it so many times as a kid, so almost no part of the story was foreign to me, however, I enjoyed it immensely all the same. It's nice to read the reviews and know I'm not the only one that's now an adult who re-read this book and liked it just as much now as we did bac I first read this book perhaps 20 years ago. I remember I got it at a Goodwill or one of those thrift stores. To this day it remains one of my favorite kid books. I recently thought about it and decided to pick it up again. I'd read it so many times as a kid, so almost no part of the story was foreign to me, however, I enjoyed it immensely all the same. It's nice to read the reviews and know I'm not the only one that's now an adult who re-read this book and liked it just as much now as we did back then. I'm not sure what it is about this book that keeps it timeless. Perhaps it's the theme of being overweight and trying to lose weight. Of being an overweight kid that gets picked on. Of being a kid that has parents that want to help, but the kid thinks the parents are being unreasonable. I'm not sure. All I know is that the author wrote a great book. The reader can really feel for Ned. Even while reading it again after all these years, I sat feeling sorry for poor Ned, who has to sit at the dinner table every evening watching his family eat an awesome-smelling/tasting meal while he has to sit and eat healthy, but unappealing food. However, crazy as this might sound, one can understand why the author put these important scenes in. It showed a Ned before and then after. In addition to this, I like how the author writes in a message. Ned talks to his older brother, and they find similarities in their situations. Ned wants to lose weight, his brother wants to run track and cross-country a little better. I know it might sound corny to the cynical, but I liked what the author did. True, the message and lesson probably weren't as subtle to an adult reading the story. I do remember as a kid the whole parallel situation going right over my head. With that being said, I think as a kid the thing I took away from this book is to never give up. That parents aren't horrible. Anger and getting angry at our loved ones doesn't help. And most of all, if WE, the individual, put our minds to something, positive things can happen. Kids reading this can also feel Ned's struggle and perhaps relate to what he went through. Especially with the war on childhood obesity that is being waged currently. This review has been hidden because it contains spoilers. To view it, click here. Nathaniel Robbins is an overweight kid trys to lose weight, but can't. His parents send him to a camp to lose weight in the summer. He tries his hardest to not eat, but still manages to do it. He only loses a few pounds at the end. But at home he manages to pull himself together to lose enough weight to be healthy. There is a text to self connection to Nathaniel and myself. When I tried to learn how to swim in a camp, I never tried to actually learn. But once it was over, I managed to learn how Nathaniel Robbins is an overweight kid trys to lose weight, but can't. His parents send him to a camp to lose weight in the summer. He tries his hardest to not eat, but still manages to do it. He only loses a few pounds at the end. But at home he manages to pull himself together to lose enough weight to be healthy. There is a text to self connection to Nathaniel and myself. When I tried to learn how to swim in a camp, I never tried to actually learn. But once it was over, I managed to learn how to do it on my own. Same with Nathaniel. He tried losing weight at the camp, but failed. However when he was alone at home, he managed to eat more healthy and lose weight. Another book (in addition to Writing and Selling Science Fiction) whose title I've forgotten for years and only remembered today. I'm rating the book four stars based on my nine-year-old self's opinion of it; I have no idea what I'd rate it as a seventeen-year-old with somewhat more "sophisticated" tastes. (I also read Jelly Belly--and The Kid Who Ran For President--in a thrift store, so it's not as if I brought it home and re-read it over and over, as with The BFG or Chester Cricket's New Home, Another book (in addition to Writing and Selling Science Fiction) whose title I've forgotten for years and only remembered today. 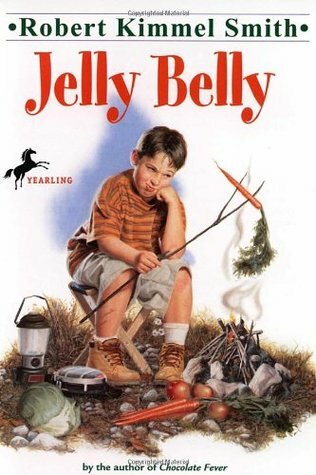 I have now finished "jelly belly" by Robert Kimmel Smith. this enlightening tale is about a boy named ned who is the skinniest kid in his family until his grandma cooked for them. now he is 4'8" and 118 pounds. the kids at shool call him "jelly belly" and his parents send him to fat camp. there, he was unsuccessful, but later on, he really did want to be skinny, and he was determined to lose weight, AND stand up to the school bully who started the whole nicknaming mess. Overweight Ned, nicknamed 'Jelly Belly', is forced to attend a fat camp. This book held up amazingly well for a re-read as an adult! Ned was a great character. He's realistic - he's afraid of the local bully and admits it and doesn't magically become strong enough to stick up for himself. He loves his grandma, but realizes that her way of expressing her love through baking and packing his lunch with double meals is hurting him. There are some great messages about standing up for yourself and grow Overweight Ned, nicknamed 'Jelly Belly', is forced to attend a fat camp. I had read this book when I was younger & to read it as an adult has bought so many memories back to me! I gave this book 4 stars because it was an excellent book for any kid trying to lose weight. It's a book about a young boy's journey to lose weight. Once Ned made his mind up to commit to losing weight...then he does just that! I Loved the relationship between Ned &his family too! Very good and easy book to read! It's a story about mind over matter & how anyone I Loved This Book!!! I liked this book a lot as a kid and just re-read it. It made me really hungry which was not the point but it was a quick and fun read. Jelly Belly is nickname for fat boy called Nathaniel Robbins, and he has a lot of nickname. Nathaniel like to eat to mush especially his grandmother's cook. And his weigh more than his mother weigh. He go to camp to less his weigh. I think Robert Kimmel Smith is a good writer. Because he doesn't only tells us the story, he but some dialogue in the book to tell you how the parents convinces his sun to go to the camp, not like "his parent convinces him to go to the camp". I love jelly belly and how he can not loss enough weight so he has to go to camp lean-to. He is so desprit to have something besides camp lean-to's food and so he eats white bread and cheese even though he does not like it. So finaly he tells his grandma to stop feeding him so much food and starts to lose weight. Recommends it for: Anyone who needs a bit of inspiration. I first read this when I was about Neddie's age, and just remembered it the other day. So, I re-read it. I must say I enjoyed it the second time, 15 years or so later. It's an inspiration to anyone who knows they are overweight, that they should lose, and just don't have the motivation. Cute, and a fast read. I'll probably re-read it again and again! Ini buku bagus lho karena mengupas permasalahan anak2 yang overweight, and kenapa some of them itu berhasil menurunkan berat badan for good sementara yang lainnya ituu selalu aja tiap tahun kembali terus ke kamp pengurusan, ahahaha.. Favorite book growing up. Read it 10+ times. i was upset. i wanted him to be able to eat his grandmother's egg bread and lose weight. I thought that the book was crazy. Another childhood favorite I reread with the kids. Good lessons in it, even though I had to reword a few curses in there. The kids both loved it. You may know that I had this one year when I was absolutely obbssesed with his books. A surprisingly accurate tale of a young boy's battle with the bulge. Despite the cheesy name, this is a decent book. The characters have depth and all is (realistically) not smooth sailing. i read this 5 times in fourth grade. gahh i<3it to death it was so funny!